Pet Portraits by Sue - Why Commission a Pet Portrait? You probably have many favorite snap shots of the pet you love. So why should you want me, Sue Wurzel, to create an oil painting or collaged portrait of your beloved pet? You are already aware of the significant differences between snapshots, even good ones, and a fine oil painting or custom collage. A work of art elevates reality for the sake of creating an image that is more permanent, more beautiful and more truthful than a photo. Let me show you how I transformed a cute snap shot into a memorable and personal portrait of a much loved dog, named Lucky. Lucky’s owner provided me with several snapshots for the painting “Hot Dog’s Shady Spot”. I paid close attention to her description of Lucky. She wanted the general composition of the painting to look more or less like her favorite photo, since this was an endearing pose, taken in one of Lucky's special spots. In planning and creating the painting in the spirit of this dog, I chose to depart from the original photo, while still using it as a reference point. 1. Firstly, I chose to crop the far right side, since it did not add any additional information to the character of Lucky. 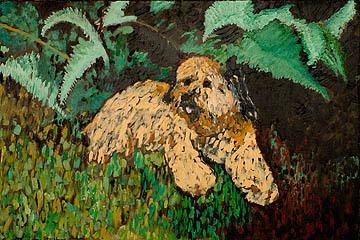 It was clear that Lucky was under a bush on a sunny day, his favorite spot, but I wanted to emphasis that he, not the greenery, was the most important part of the painting. 2. Then I altered the tilt of Lucky’s head so that he was facing more towards the viewer. I wanted him to engage with the person looking at his portrait. 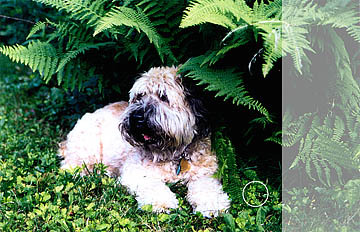 Lucky was an engaging dog; that was part of his special personality. 3. Next I used a combination of other photos provided to me by Lucky’s owner as my reference points for Lucky’s true colors. I was told that Lucky looked “bleached out” in the favorite snapshot. This, as you may know well, is a frequent flaw in snapshots. 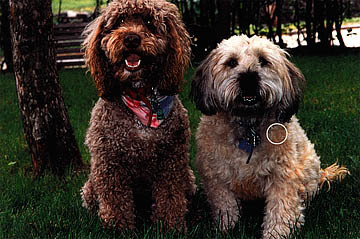 The owner gave me images that more accurately captured the Lucky’s colors, but the image had none of Lucky’s charm. This is why it is helpful to have more than one photo. 4. In the first photo, you can see greenery bordering Lucky’s left leg. However in the final painting his leg is adjacent to greens on one side and rich deep brown and red earth tones on the other side. This change was my artistic decision and served to accentuate the lush warm ochres, yellows, and browns in Lucky’s coat, more true to life. 5. Finally, I choose loose, free thick brush strokes to reflect the nature of Lucky’s curly coat and his playful personality. This was perhaps the most significant artistic decision that I made. This painterly texture made Lucky’s personality and beauty come to life. This is a significant difference between a photographic technique and a beloved pet portrait. Lucky’s owners truly love the portrait and they have continued to cherish it now that Lucky has gone on to the big leashless doggy park in the sky.